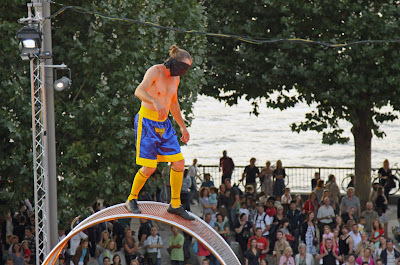 More from the Thames Festival. Clever and funny from Les Studios de Marseille. First he played the crazy waiter, then did a striptease. Here he is blindfolded. Maybe a couple more pictures from the festival leading up to the competition later in the week. Looking forward to seeing them! Incredible pic! How did you manage to catch it? Climbing on to what?!? Brave daring girl, you are! But you weren't blindfolded, at least, were you? Never been to the Thames Festival but it looks like a good time! Nope never even heard of the Thames Festival - now I'll keep an eye out for it next year as I need an excuse to head on down there again. I wonder if he made it across. You never know. Thanks for the visit to my blog and for the comment there about the quill pens. This looks a bit scary I think. He must have been very good at what he was doing. Love to see more pictures from this festival. Glad he had his shorts on! That looks crazy, and like a festival I would really enjoy.